From now on, Light in the Valley, a quilt pattern that creates an optical illusion that lends it a three-dimensional effect, can no longer be quilted. That particular pattern has been copyrighted, and Almost Amish, the company that bought the copyright, has sent letters from its attorney to representatives of Lancaster County quilt shops and nearly every volunteer fire company here that hosts a mud sale, telling them to cease and desist selling that quilt. Protecting a pattern by enforcing copyright is very unusual in the Amish quilt industry, since taking legal action runs against the grain of Amish humility and is usually not allowed under the Ordnung. Historically, quilt patterns have been shared freely among community members. Prior to the advent of the booming commercial market for quilts, friends, neighbors, and relatives borrowed and adapted one another’s quilt patterns, with particularly gifted designers receiving requests for patterns or pieced tops. Trendy patterns spread throughout given settlements. This continues today, with an eye toward which patterns are most popular among consumers. Quilt entrepreneurs want to make quilts that will sell, and enforcing copyright certainly is a way to protect one’s design. Many of the quilts sold in Lancaster County are based on commercially available patterns, which by law are protected by copyright, but rarely has this copyright been enforced. The “right” thing to do? When I was researching my Amish business book, I remember one Amish furniture craftsmen who expressed annoyance at having his designs copied by others. Legal action is not the Amish way, so he had little option other than to be annoyed. This company is Almost Amish, not Totally Amish, so different rules are in place. My thoughts after reading the story was that this would generate bad press (most of the comments in the story are negative towards Almost Amish, as are most reader comments). At the same time, it is one way to draw attention to your business, intentional or not. I was not aware of a pattern called Light in the Valley before this…now I am. A year from now when this story is forgotten, people wanting this pattern will have only one place to go. This may set an example for creators of unique quilt designs in future, though an owner of Almost Amish doesn’t seem to think so. Many other unique creations are copyrighted and patented, after all, including inventions created by Amish people. Maybe this is just the next step in the commodification of Amish quilts. However the fact that this is an Amish quilt and not an obscure widget may place it in a different category for some. Quilting is symbolic of the Amish. It’s traditionally a communal practice, and both quilts and their designs have been passed down from one generation to the next. Like the Amish practice of transferring farmland over generations, Amish quilting has a flavor of stewardship over ownership. Additionally, the fact that these are non-Amish people who now hold copyright to an Amish-created design (even though it was copyrighted and then freely sold by an Amish person) may rub some the wrong way–all the more so given the emotional weight attached to Amish quilts. I think it stinks and it shouldn’t be allowed. The events described here are taking place in United States of America, which is where I live. In our country, copyright protection is a fundamental part of our founding as a federation of states. In order for the copyright holder to be forbidden from protecting its property, the US Constitution would have to be amended, which is a long and difficult process. I bought this pattern quilt top two years ago at an Amish School sale in Beaver Springs. The colors were very blah and somewhat ugly. I paid 60.00 for it. My sister completed the quilting with goose down from a comforter that was worn out. The final product has some polyester peices and it’s still ugly but it does present the 3-D effect. My sister says she will make one for me in better colors for my personal use. I have to wonder how much the copywright was sold for. I, myself am going to make one for a gift for a family member and my sister has agreed to quilt it into a final product that will not ever be sold. I’m torn about the copywright concept. I just don’t get it why it can be copywritten. And this is what happens when a dominant culture pulls aspects of a minority culture out of context. I pastored a church that raised money each year by the quilting efforts of several women. It was a social event for them to gather weekly through the winter to produce a quilt, and then auction it in the spring. They resisted producing the quilts to order; they wanted the freedom to choose the design and materials to suit their own aesthetic. There is nothing inherently wrong in Amish families producing quilts to sell, nor is there anything inherently wrong in copyrighting one’s intellectual property. The issue now is that the communal and handcraft nature of a quilt design has been commodified, and as Erik notes, this will lead to an industry that removes the Amish quilt from the Amish community and culture. I was wary of “Almost Amish” doing this when they first began their business. However, it will be up to Amish church districts to decide if they want to continue in this process. The bubble will burst, and the fashion for Amish-associated goods will fade. I would guess it has already peaked. Personally, after google searching for an image of this quilt design, I know I would not want it. My taste is for more primitive folk designs, and I dislike the optical illusion effect. Interesting points Julie, just to touch on one of your side points, on the fashion for Amish products perhaps being past peak already. I have wondered if that’s the case (we had a similar question on Amish fiction not long ago)…and I don’t have a great sense of it. Comparing Amish furniture outlets today to two years ago, I’d say the number of retail stores nationwide has moderately increased. Factors like frustration with busy lifestyles and nostalgia/pseudo-nostalgia for a slower pace of life I think will remain, and the Amish are probably the most prominent real-life symbol of that, along with their products. On the other hand, it’s been a solid 3 or 4 years now of television, fiction and media on the Amish, and we usually have a pretty short attention span. Hate to say it but she sold it to them. Very unfortunate! That is true. She might want a do-over on that. I do wonder how much you’d have to change to take this design and make it “unique” again. Is it as simple as adding a border, changing a color, or a slight twist in the pattern? I guess we’d need to ask someone versed in this kind of copyright. i FEEL YOU WERE TAKEN ADVANTAGE OF. I hope my point was not misunderstood. STOP WITH THE ALL CAPS! Ralph, do you shout like this at home? I don’t think just making a change would be sufficient. I suspect, though I have not studied intellectual property law in several years, that modifying the artwork would itself infringe the copyright. The idea of copyright, as supported by the federation’s Founding Fathers, is to encourage creativity by preventing one person from doing the work and another taking the rewards. Copyright also ensures that the artist maintains control of the presentation of their creation. Exactly! If people want to upset, they should be upset at the designer that cashed-out by selling her copyright. I googled the quilt image–it’s kind of bizarre looking, I think–not many people would want to buy it compared to all the other quilts out there for sale. I can’t see it being a huge deal after this year passes. Thats an ugly design, I really don’t think anybody is going to miss it. I have become a fanatic of this verse, and have begun to search out ways of my life that do not follow this commandment. So, I appreciate the Amish quilts. Sorry, after my quote, I meant ‘KJV,’ not ‘KJZ’! Questions I have — What are Amish thoughts/teachings about having their work copyrighted? Do teachings on copyrighting vary among districts/affiliations? Is Mary Beiler’s having her quilt pattern copyrighted consistent with Amish teachings? Good questions Al–getting a copyright seems to imply potentially taking legal action which Amish are not apt to do (though, you can’t say it never happens…). The fact that a copyright is in place may discourage someone from copying a design however, same with a product patent, and that may be the thinking involved in these cases of Amish formally registering their intellectual property (even if they have no intention of legally enforcing it). It sounds like Mary Beiler had the copyright but chose not to enforce it, which if she had would probably have brought her under the scrutiny of the church. As to your question about different affiliations, I would think that yes, you would be less apt to see an Amish person do this (even with no intention of legal enforcement) in a more traditional/conservative community than Lancaster County. A copyright is not something you actively pursue. You do not choose to have your work copyrighted — the right is there the instant the work is created. You only choose whether you are going to enforce your rights. Many people confuse copyright and patent, but they are quite different. You must be granted a patent, but you automatically have a copyright on every original creation. It may be different in other countries; I am writing as an expert on the USA legal environment. Will the English owners of Almost Amish now hire a team of undercover (pun intended) agents to scour the nation hunting down scofflaw quilt makers so they can drag the stitching felons into court? I reckon I better be careful the next time I prepare a meal using Amish supplied recipes. Some English business owner might have me arrested for grand theft ham loaf. “Almost Amish” is really “Totally Greedy.” There needs to be a means to license the design !!! 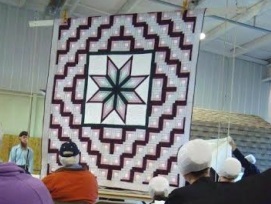 At the 2013 New York State Auction for Haiti there was a purple and white Light in the Valley quilt. It sure was a show stopper. Taking private property without due process, such as forcing the licensing of a design, is frowned upon. Stephanie, I have the same feelings. I have been in that shop only once and was terribly disappointed at the amount of merchandise that was marked “product of China”. I feel this does a dis-justice to the Amish community as the quality of their work is exemplary. Having said that, ‘Almost Amish’ now owns the copyright and it is theirs to do with as they please. But,I do agree,it is unfortunate that they have chosen to take this direction with it. I quilt; I piece using a 100-year-old treadle machine and then I spend a year or more hand-quilting. Quilts are labors of love and islands of peace in a frantic world. Most quilt patterns in magazines are actually copyrighted with the intention that they will be copied for personal not commercial use, but then, the law says if you substantially change something, it becomes yours to do with as you wish. It’s a fine line – I could show the quilt at the county fair but if it is identical or very close to a published pattern it’s not supposed to be for sale. My biggest concern is someone like this Almost Amish or another business taking dozens of traditional blocks or designs (Ohio Star, Monkey Wrench, Grandmother’s Fan or Drunkard’s Path, Sunshine and Shadow) and COPYRIGHTING them and forbidding the creation or sale of a traditional pattern. We have seen this with other movements, words and books (there is a legal battle concerning the words “urban homesteading” because a family in California has copyrighted the word even though they did not coin it). Are we looking at a slope where if they can enforce a copyright to the point of preventing someone from selling their personal property either privately or at a mud sale, that someone else will swoop in and copyright traditional blocks and designs? This could actually lead to the destruction of a traditional fabric art in quilting because the patterns would not be allowed to be reproduced by magazines or quilting books unless it was by the copyright holder. Maybe I’m over-reacting a bit here, but the idea that someone could say to me that I cannot make a quilt, using a beautiful pattern and my interpretations of it is very disturbing. If this copyright is enforceable, who is to prevent someone from taking the old patterns and copyrighting them, too? Long comments are a-ok Karen, you brought up some interesting points here. It’s nice to get the quilter’s perspective. It is a Bargello style quilt. Bargello itself is a traditional style of needlework, then in the 1990s, someone published a quilt pattern adapted from Bargello needlepoint: http://www.amazon.com/s/ref=nb_sb_noss_2?url=search-alias%3Daps&field-keywords=bargello%20quilt%20. The story I heard about the Amish woman who designed purported that she based it on a needlepoint chair cover in the Bargello style. It is highly unusual for traditional styles of patterns (in contrast to “art” quilts or other original designs) to have copyright that is enforceable, since it is difficult to assess what the “original” design was. I really would be surprised if copyright enforcement takes off in the Amish quilt industry, especially given the negative reaction in the comments, and the hesitancy of Amish and Mennonite entrepreneurs to take legal action. There are time limits to copyrights, so a “traditional” design may be too old for the copyright to be enforced. Books that you find at places like Project Gutenberg are works that have expired copyright protection. The idea is to protect the creator, not their descendants in perpetuity. That pattern was copyrighted long before these women were involved so therefore they are guilty of copyright infringement!!! Im totally and complete with Karen.. I think its insane to copyright and even think about enforcing a quilt pattern patent..
Insanity has taken hold of our world.. and we sit by & watch it happen every day, not realizing the implications it holds for us.. The instant somebody designs a quilt pattern, they own the copyright on that pattern. The only way they can not own the copyright is to transfer it to somebody else. I don’t think a seed can have a copyright, though a seed catalog can. A seed can be protected by a patent, if it meets the requirements and the patent authorities grant a patent. I wonder if you change the pattern just a bit you can get around the copyright ? In the mean time I say BOYCOTT Almost Amish ! I know lets let “Amish Mafia” take care of this ! I’ve heard about the ‘Amish Mafia,’ and before I cut out videos from my life, I watched the 1st two episodes. I do not appreciate the characters. The characters, who I’ve heard claim to try to bring people to the church, are not providing justice to the Amish community. Sure, in the 1st episode, they upheld (many) of the community’s morals, but what about ‘not making a graven image’? This is my main problem with the show. Exodus 20:4 clearly states “Thou shalt not make unto thee any graven image, or hte likeness of any thing that is in heaven above, or that is in the earth beneath, or thta is in the water under the earth” (KJV). In other words, the Bible tells us not to make the likeness (photos, videos, statues, paintings, etc.) of nature. Romans further says this: “And knowest his will, and approvest the things that are more excellent, being instructed out of the law; and art confident that thou thyself art a guide of the blind, a light of them which are in darkness, an instructor of the foolish, a teacher of babes, which hast the form of knowledge and of the truth in the law…Thou that abhorrest idols, dost thou commit sacrilege? Thou that makest thy boast of the law, through breaking the law dishonourest thou God?” Romans 2:18-23, KJV. I can’t really say that I am sympathetic to the ‘Amish Mafia,’ probably because I am bias on the ‘image’ matter. Even tough I think it’s an ugly deign I would boycott Almost Amish. What a greedy thing to do! Pretty much rotten. It does sort of go against the whole spirit of quilting. But then- all these ‘Amish’ brand businesses that have nothing to do with the Amish are completely ridiculous anyway. If you want an Amish quilt, find an Amish lady to make one for you. There are a lot of them out there doing just that. Those are expensive–but then you’ve got the real thing. If you want some machine made cheap knockoff– fine- get it. Most “Amish” made items for sale today are not Amish made. There are even Amish selling items that look Amish made, baskets, quilts, vegetables, that are not Amish made. Of course if you ask them if it is Amish made, or grown, they would say no, but most people don’t ask, they assume an Amish made it because an Amish is selling it. I bet most Amish style restaurants are not owned and operated by Amish, they just hire Amish to be the servers, sometimes the cook. For this reason it does not surprise me that the English have found yet another way to exploit the Amish and make a bundle. I am a quilter and I could put Amish on my quilts and list them on Ebay for 2, 3, 4 times as much as I get now and sell them. Because we live in a greed based world buyer must beware. So Frau Beiler no longer holds the copyright of the quilt? Is it that the Amish community is trying to sell the quilts, along with ‘Almost Amish’? As a former employee of a church currently working in the publishing industry, I have another take on this: Churches and charities are often the first to violate intellectual property rights on the grounds that it’s “for a good cause,” failing to see that this is no different from stealing your neighbor’s car to donate it to the church. You shall not muzzle the ox that treads the grain; the fruits of a person’s labor are theirs to use or sell as they wish. This Amish woman designed the quilt pattern, registered the copyright, and sold it; that was how she used it to make her living, rather than by churning out quilts herself. The money paid to her would be a total waste if the buyers did not enforce the copyright. To say that it is not “Christian” to do so is like saying it is not Christian to lock your car, or to call the police when it ends up in the charity auction. This problem tends to come up with things like religious music; composers have nothing else to sell, and yet some “Christians” feel entitled to copy their work for nothing. Why do people struggle so much with the idea that intellectual property is, well, property? I WOULD SAY THAT MAYBE THE PURCHASERS MAY HAVE TAKEN ADVANTAGE OF SOME ONE THAT DIDNT KNOW ALL THE RULES OF DOING BUSINESS.THE AMISH SURE ARE SOMETIMES TAKEN ADVANTAGE OF EVEN THOUGH ARE EXCELLENT BUSINESS PEOPLE. I do agree with most of what you have said! However in the case of this pattern it was copyrighted in 1974! That being said it was never the right for this woman or any other to claim it as their original design!!! Hmm, they might want to rethink that. I googled the pattern and thought it looked familiar. Turns out it is exactly the same as a pattern that is called Pomegranates Bargello. That pattern is published in many places! They fraudulently copyrighted that pattern! In order to enforce copyright, what information has to be provided with the quilt? Anything? Are the sellers required to stitch a copyright symbol and copyright owner name into the quilt? If so, what would that do to sales? What if, in order to enforce the copyright they were required to point out in lettering large enough that customers could not miss it, that this quilt is copyrighted contrary to Amish traditions? Hi Anna — Thanks for the information about Pmegranates Bargello. I did a google images search of it and Light in the Valley and got similar images — differing only in color. Great detective work. if i own a painting an original i wonder how could get it copyrighted without written permission from the artist,does any one know? and I know we covered media law in Canada, including aspects of media related copyright. have felt they couldn’t afford to keep the notorious Don Cherry. So at this point, no one can make a quilt with that pattern. How are they going to stop someone who already has that pattern and makes one for themselves? Is the “Amish Mafia” going to come and tear it off their bed. I truly don’t believe this is the way the Amish people would want this. If the woman had not sold the copyright, none of this would be happening. Obviously, getting the money was more important to her than freely sharing her creation. Whenever you copy somebody else’s work without their permission, you are stealing. Copying a quilt pattern is no different than copying a movie or a book. There are “fair use” exceptions, for example this blog could show a photograph of the pattern as part of the discussion. I research and write about copyright law, and this is an outrageous misuse of copyright. The simple geometric pattern is barely copyrightable, and similar-but-not-identical geometric patterns will thus generally not be infringing. Any competent copyright attorney should know this. In just the first paragraph, the author mentions two older books (1967 and 1972) with this pattern. The Amazon link for the first book, Elsa S. Williams, Bargello: Florentine Canvas Work. (New York: Reinhold, 1967), shows the “Light in the Valley” pattern on p. 44. Decker quotes Williams explaining that it is actually centuries old. “One of the oldest patterns, this is frequently found in Early American collections. It has been used for purses, pillows, and chair seats” (44). Another book mentioned by the blogger, Bargello: An Explosion in Color (1974), has the pattern ON THE COVER. If Beiler wasn’t the first person to create the pattern, her copyright filing is an invalid basis for stopping others from using the same pattern. I hope Almost Amish will agree to stop immediately and to send (appropriately apologetic) notices to those they’ve needlessly scared. Bill, thank you for this post. It sounds like this shop is vastly overreaching both the spirit and letter of copyright law in order to bully others into paying up. I note, for instance the store’s lawyers have notified volunteer fire departments to cease selling the quilt. This is NOT a proper application of copyright law. For example, although a book may be copyrighted, the copyright holder cannot stop someone from selling the book at a garage sale. Fashion design, notably, cannot even be copyrighted. Sadly this type of legal extortion know as patent trolling or copyright trolling has infested several other industries. Small fire departments and vendors are often scared to get involved in a legal dispute, thus will comply with even an outrageous demand. I suggest that readers of this blog boycott the “Almost Amish” shop. When its owners realize that bullying and extorting community members is not only un-Amish, but is bad for their own bottom line, they will stop. So Amish shouldn't be able to sell intellectual property? There is a world of difference between reselling a used copy of a book and COPYING that book to sell the new copies (or simply to refrain from buying more than one copy). Believe me, if you make a habit of selling unauthorized copies of copyrighted books, eventually, the copyright holders will catch up with you. I urge those who are so outraged at Almost Amish for enforcing the copyright to reconsider plans of a boycott. The unintended consequence would be that no one will pay money to an Amishman or -woman again for intellectual property, because they will fear that they, too, will be painted as the big bad English business and will be financially punished by well-meaning people with no respect for intellectual property rights. This will not protect the rights of the Amish; it will take away their right to choose between selling their work by physically making copies of it or by selling the design to someone else. Again, why is it so hard for people to understand the concept that intellectual property is property? The designer had a right to sell what she created, and she chose to do so. Do you suppose she would want to take that money for nothing? What she sold is only of value if others do not steal it. Almost Amish is merely protecting itself against theft. The fact that much of that theft may have been misguided rather than malicious does not help them. People only get credit for being misguided for so long. When clear explanations are repeatedly ignored or rejected, at a certain point the ignorance becomes culpable. Trish, no one is suggesting that the Amish shouldn’t be able to profit from their intellectual property. That isn’t what is happening here. First of all, the shop isn’t suing people who make COPIES of the quilt – it’s sending threatening letters to anyone, including voluteer fire departments, who SELLS a quilt. This is a vast overreach of copyright law – copyrights, to give an example, don’t give an author the right to tell a bookshop how to sell a book, or prevent a reader from giving a book he buought to another person. And beyond that, does copyright law even apply here? You can’t copyright shapes like triangles and rectangles. Entire industries, including fashion design, do not benefit from any copyright protection at all. What it sounds like this shop is doing is not helping Amish people market intellectual property. It is engaging in a form of legal extortion: sending threatening letters to people and small organizations which have no budget or wherewithall to fight an expensive legal battle in court, and therefore, quickly agree to whatever the shop owner’s demands are, even though they have no basis whatsoever in the law. Since there are published patterns from the 1960’s the Amish women who received the copyright for her quilt did not create the pattern. So she had no right to the copywriter or to sell it to Almost Amish. If I made that pattern I would buy a copy of the books from the 1960’s and use that pattern. Almost Amish’s purchased copywriter was from the 1990’s. “Copyright protection subsists from the time the work is created in fixed form. The copyright in the work of authorship immediately becomes the property of the author who created the work….Any or all of the copyright owner’s exclusive rights or any subdivision of those rights may be transferred”. I hope I do not sound hostile, but given this information, I can see why the owners of this copyright think they are on solid ground. Trish from Indiana: Did you see what I wrote above? This design is older than the registration, and it’s probably centuries old. That means Almost Amish has no right to stop people from selling it. It would be like a book publisher releasing a version of Pride and Prejudice with a brief, new intro, registering a copyright, and trying to stop other publishers from selling other versions of Pride and Prejudice. Almost Amish has no leg to stand on, and they owe a big apology to the culture that is the source of their business model. A couple points that deserve correction above: Producing a new quilt with a legitimately copyrighted design, without the copyright holder’s permission, actually is still infringement. And one can copyright combinations of geometric patterns as long as there is some artistic creativity that is uniquely the expression of the creator. The simpler the pattern, though, the thinner the protection, if any. I think this pattern would be nominally copyrightable (is a hard case), but only copying the exact pattern (as in a quilting pattern book) would be likely to be an infringement. Copying the overall idea of the pattern would not be infringement IMO. I’m not a lawyer, but I am a published legal scholar and professor with particular focus on copyright in my research and teaching. None of these credentials are required, though, to demonstrate what I showed in my last post. The registration is for a 1998 creation, but the design predates that by several decades at least. Thus, not a valid copyright, and thus no infringement. Not a hard case. An open and shut case that any law student could prove. Thanks for the insights Bill. I know “copyright trolls” and “patent trolls” have been a scrouge of the tech industry for some time. It is sad to hear about this nonsense coming to Amish country. Now that word of the shop’s tactics is getting out, I hope that someone stands up and challenges their claims in court. The community should not have to consult lawyers before holding a quilt sale. Certainly, if a court found that the pictorial design on the quilt was so similar to one already in existence, it could not be copyrighted, then that would be a reason for Amish America to receive a refund, because the “property” they were sold was not the seller’s to begin with. I don’t suggest it was in any way intentional by the designer; probably more like “subconscious plagiarism.” It happens. My point is that the rage against the shop (right down to calls for a boycott and even calling their actions “not Christian”) for attempting to enforce a copyright we really have no reason to believe they did not buy in good faith, believing it to be valid, is inappropriate. To me, this reaction suggests a rejection not only of the validity of this particular copyright, but of the very principle of copyright protection. People should not be treated as villains for standing up for legal rights they have reason to believe they have, even if they turn out to be incorrect. I do think it would be a good idea for anyone in the future who copyrights a design (not just the printed pattern, but the pictorial design itself) to have a copyright notice tag put on all quilts made with an authorized copy of the design. Even though this is no longer legally required, it would certainly be helpful to future buyers and sellers of the quilts. No one has argued against the principle of copyright protection nor suggested that someone shouldn’t be able to profit from their own intellectual property. That’s not what we are discussing. The issue here is HOW this business (a website, not a shop) is “enforcing” its copyright. And of course the face that the very “intellectual property” they claim to be “protecting” in fact was never their unique property to begin with. If a book publisher sent out demand letters to used bookstores and charities holding book drives, claiming that copyright laws forbid their books from being resold, outcry would be swift. Essentially, that is what is happening here. Even worse, this business is hurting legitimate organizations, like the volunteer fire department, that have long served the Amish community. No, this isn’t Christian, and it’s certain not Amish. There’s a lot of questions I would like answers to. For estarts, has this business collected any settlement money through its demand letters, and how much? What percentage of their revenue comes through copyright enforcement, and what through selling other things? Has the business actually sued any community groups or individuals over the copyright, or are they just sending out demand letters? What do the demand letters say? Are they claiming ownership rights over the quilt itself, or just the pattern, or what? How much, if anything, did they pay the creator of the quilt for the alleged “copyright”, and does she get any ongoing residuals? How did they approach the quilt creator to buy her “copyright” anyway? How did they decide on a fair price? Did the business conduct any investigation into prior works, investigation which might have shown that this work had been around for decades? Unless and until satisfactory answers are received to all of the above, a boycott is an appropriate manner to stop the parasitic behavior of this business within the Amish community. If the Amish don’t want to litigate, to protect their intellectual property, then they might as well sell off that property. The Amish have survived and prospered for centuries without litigating. And while there is no trademark on the word “Amish”, it is not hard to determine who is actually Amish or not. I’m not sure how to explain it, actual members of the community could, probably better than me, but a famous example is Quaker and Quakers. The multinational food company and the religious organization (or members thereof) [the Religious Society of Friends – “Quakers”], it seems to me that the company initially tried to capitalize on the good name and reputation of the faith. This gets into an interesting discussion about the benefits both Amish and non-Amish people gain from the name and trademark/brand/whatever you want to call it. Even though it’s uncommon that Amish people use “Amish” in their official business names, they undoubtedly benefit from the positive perception around anything Amish. Often non-Amish businesses (ie retailers) use the name for them in their own promotional efforts. Amish benefit from advertising using the Amish name in this case but do not have to be the ones using the name, the promotion using the name is in a sense offloaded to the retailer which is typically a more comfortable arrangement for the Amish side of the equation. I know that some have been reluctant for people selling their goods to promote emphasizing the “Amish” aspect of the product, while others seem to have no problem with it and if they don’t use the word Amish in their name it might be mentioned in their literature. And certainly, Erik, judging from this thread, feelings run high on the matter, even (or perhaps especially) among non-Amish. It sounds as if this particular quilt case involves a lot of questions of both law and fact. Whether those questions ever get resolved in court depends on how far the parties involved are willing to pursue the matter. My hope is that something equitable for all sides can be worked out that shows clear respect for the right of the Amish to support themselves from the fruits of their own labor in a manner they consider appropriate. As an “English” person, I may not always be comfortable with their decision to trade on tourists’ images of them, but it’s their image, and as long as they themselves are making the decision about what to trade, that is their business. The one distinction I would add to the analogy Ed offered is that while a publisher could not prevent a used bookstore from selling second-hand legitimate copies of a book, it could certainly prevent the sale of illegal copies that had been made in violation of copyright, even if these were second-hand. If the bookstore bought them in good faith, I cannot imagine them ending up paying any monetary damages, as long as they ceased to sell the books once notified, and the bookstore might well have a case against whoever sold them the books. Whether they would consider it worth their while to pursue it would, I supposed, depend on how many they bought. The real question is whether particular quilts really infringed on a valid copyright. (I’m no expert, but the pomegranates pattern sure looks just like the light in the valley pattern to me.) If it gets to court, that will probably be a major point of contention. Just to add one more thought, I am guessing the fact that this copyright (leaving aside the challenges to its validity mentioned above) was registered by an Amish person and acquired from an Amish person, probably gives the owners of Almost Amish a sense of license from the community, since it has been sanctioned by a member of the community. Nevertheless, I think a good part of the widely negative public reaction is about how the action conflicts with the values of the people whose products they are representing and selling. It can be taken to demonstrate either a lack of knowledge of, or indifference towards what are widely understood as Amish beliefs regarding use of legal force. Not that every person who sells Amish products has to 100% mimic Amish ways and beliefs (and not that every Amish person completely abstains from use of legal force). But you are already getting the benefit of the Amish name. Maybe this is just an indication of how competitive the Amish products business is becoming in some places. Wow Erik — there’s some more information in those forums that is very disturbing. For example that Ken Treadwell, the owner of the business, is said to have sold quilts made in Cambodia as “Amish quilts” before being taken to task by the community. The Amish woman who “sold” the copyright (actually not a unique design) didn’t realize what she was doing, she merely filed the copyright at the Treadwell’s request. While I’d like to independently verify the above, it is more than enough reason to give me pause before ever doing business with this company. I also note that “Almost Amish” is not even an actual store, just a website using a Lancaster County P.O. box. I really don’t know how reliable the comments about Cambodia or the Amish woman’s awareness are, maybe so, but could not find anything else, at least online, about those claims. I found some of the discussion of the ins and outs of copyright registration interesting though, especially at the first link. I have actually been in a store in Lancaster County with the name “Almost Amish” is this not the business that is being discussed here? That’s just a few…think about how outrageous it could get! Please send me a copy of your copyright license number. This pattern is the same as a few others under different names and until I see proof of an officially registered patten / copy right, I just have to believe none of this is true. I’ve been studying quilters copyright rights for awhile now. Most of what the majority of quilters out here have been less to believe are simply not true. Make and sell whatever quilts you like! Copyright, as it pertains to a quilt pattern, protects the actual printed pattern and instructions. You may NOT copy the pattern or instructions for resale. Copyright protects author’s rights. Copyright does not pertain to actual practical items, for example, evening gowns, aprons, or quilts. You may sell anything you have sewn, no matter what pattern you have used. There are no laws that control what YOU do with YOUR sewn items. Some pattern manufacturers or designers might like to convince you other wise, but the law is not on their side. I just won’t be ordering any patterns offered by this company. I do not want to encourage their actions in any way.